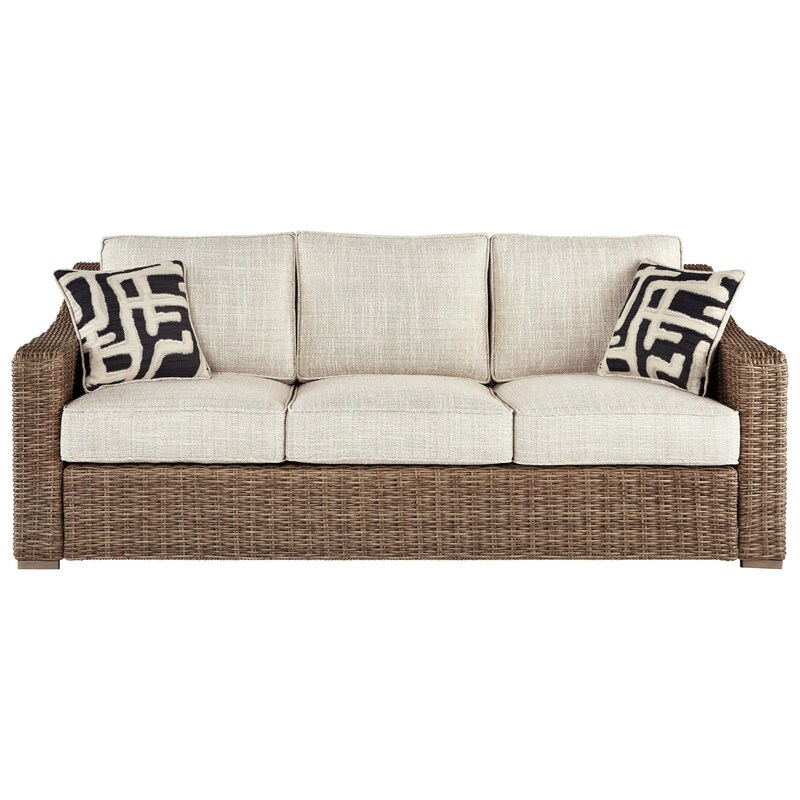 This gorgeous sofa has everything you need to transform your outdoor space entirely. The resin wicker construction is visually appealing, and beneath its exterior is a rust-proof aluminum frame that offers resistance to all weather conditions. The Beachcroft Sofa with Cushion by Signature Design by Ashley at Miskelly Furniture in the Jackson, Pearl, Madison, Ridgeland, Flowood Mississippi area. Product availability may vary. Contact us for the most current availability on this product. Construction Rust-free aluminum frames and porcelain table tops. Who says interior design should be confined to the indoors? Bring your design skills to the exterior of your home with the help of this stunning outdoor collection. Featuring neutral tones, subtle farmhouse vibes, and gorgeous resin wicker, these stylish pieces will transform your outdoor space. Rust-proof aluminum frames and high performing Nuvella™ fabric allow these pieces to maintain their appeal for years to come - rain or shine. The Beachcroft collection is a great option if you are looking for Casual Outdoor Furniture in the Jackson, Pearl, Madison, Ridgeland, Flowood Mississippi area. Browse other items in the Beachcroft collection from Miskelly Furniture in the Jackson, Pearl, Madison, Ridgeland, Flowood Mississippi area.